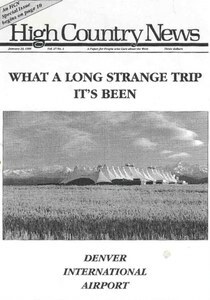 Special issue on DIA, visitors, reporters in Yellowstone waiting for wolves. Greater Gila Biodiversity Project and Gila Watch file suit against Catron County's "wise-use" ordinances. Federal biologists say grizzlies are "recovered" and no longer need endangered species protection in greater Yellowstone area. Four wolves are returned to Idaho's Frank Church-River of No Return Wilderness. Bruce Babbitt gives up on grazing reform. Judge upholds Clinton administration's Option 9 plan for forest management. Louisiana-Pacific must pay settlement to Olathe, Colorado, families who sued under Clean Air Act. Environmental lawsuit demands the Forest Service do analyses for 150 grazing allotments on the Beaverhead National Forest. Developer Tom Chapman makes huge profit trading his wilderness inholding in the West Elks Wilderness for land near Telluride. Media, elected officials and the city of Denver all share responsibility for DIA and its problems.